OK, since I'm tired of reading how well everybody else's maks work, I've decided to try and tune up mine. Going to do the following: Dew shield, internal flocking, laser collimating, stop down turned edge. These are some initial things. So I've got a few questions. 1. I read somewhere how to place a center spot on your mirror. My primary is not adjustable, as it sits pressed up against a machined annulus which is bolted to the tube (presumably square). Will I need to mark the center spot in order to get a good collimation using a laser collimator? If so, how? Secondary is adjustable only as to tilt, as it's mounted in a biscuit hole in the meniscus lens. 2. Turned edge...how much should I stop down? I know its just a guess on your part. Just guess. 1/4" around? 3. Is it likely that the primary and the meniscus lens are radially matched? 1-either you put a dot with a permanent marker, or you could put on of those sticky rings you buy in office supplies store to repare binder pages when the page has been ripped from the binder. On an 8" the permanent marker seems easiest to me. And yes, it makes laser collimating much easier. 2-not a clue, I guess you ould need to have a report of some sort showing how much it is turned. How do you know you have a turned edge? 1-focuser upgrade? How well does you focuser work? Can someone direct me to a thread that describes how to determine the center of the mirror? Matt, I had one of our local astronomy club gurus do a star test on it. After it had cooled down (like 2 hours after set up), he told me it had a slightly turned edge. I think I've seen pencil marking on the edges of both the meniscus and the primary, so I bet those are intended to be lined up. If the 8" Vega Mak-Newt is anything like the 6" Vega that I took care of in College then Yes the both the meniscus and the primary are matched probably to minimize a small amount of wedge on the meniscus. I doubt it had a turned edge the Vega scopes are like the Quantum series by OTI and Questars. These scopes are essentially hand made by an artisan who won't let it out of the shop until it is perfect. A turned edge can be easily diagnosed with a Ronchi filter and the moon. William Bell sells a 133 line Ronchi for a few dollars (<$5). Hold the Ronchi filter near the scopes focal plane and look at the moon. Focus until there are 3-4 lines visible. If the lines are straight then there misn't a problem. If the ends of the line have a hook to them there is a turned edge. If there is a turned edge you might check to see if the annulus is pressing to tightly against the primary. If you are not the first owner the previous owner may have jacked the screws down to tight. The easiest way to center mark a mirror is to pull the mirror cell out of the tube and then cut out a paper circle of the same diameter as your mirror. Fold the paper cutout into quarters and then snip the very tip off...small snip. Unfold the paper circle and voila you have a hole cut out of the center. Carefully lay the cut out onto the mirror and mark the center with a sharpy. It makes collimating much easier! Great idea Ricky, it sure beats using two rulers at right angles like I have done in the past. So Bob, you've seen the Vega before? First or second generation? 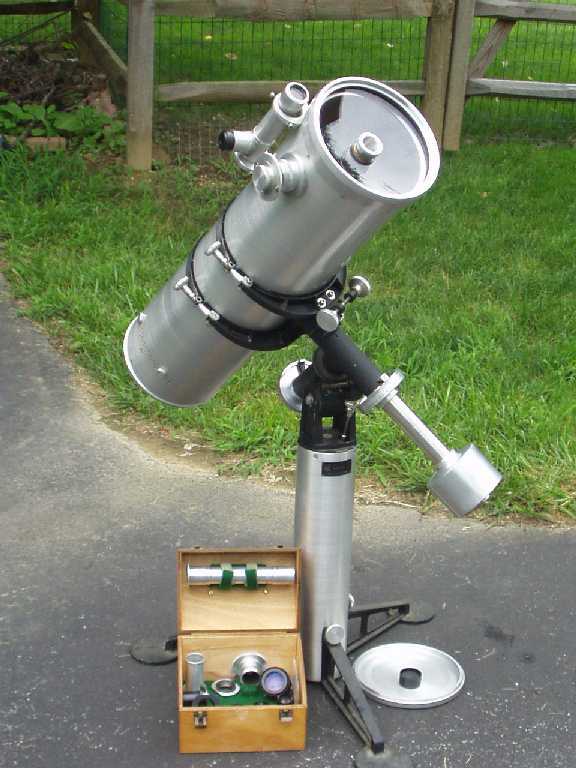 The first gen had all aluminum construction and a unique focuser and eyepiece mounting system. I've had this thing apart and together so many times it wouldn't matter what the previous owner did. Most recently I had the mirrors recoated. Stupidly, I paid no attention to the pencil marks on the edges of the glasswork. When I take everything out to flock the tube, I'll be certain to align those marks as best I can. What college did you go to that had the Vega? I wonder if it's still around. There weren't many made in total, you know. Ricky, Thanks, I know I had seen something somewhere before. My only problem will be that my scope is f/4 and as such has a fairly deep curve, so merely marking a circle on paper around the outside of the mirror won't really conform the mask to the curve, but it should be close enough if I'm careful. The 6" Vega was the all polished aluminum version. It was a joy to behold and use. The real question about the alignment marks are where the marks align in the cell. Look to see if there is a matching mark on the edge of the cell. When you put primary back into the cell did you tighten things too much? Both the primary and the meniscus should be a loose fit in their cells. They should be able to move, but not rattle. The State University of New York at Brockport was the college. I was a met major their and by chance learned that one of the physics professors was really an astronomer. Even though I had be on the roof to maintain the instrument pack I hadn't realized that the elevator head had a room filled with toys. One of the toys was the 6" Vega. Did it look like this? Oh, BTW, I have tightened at least the primary too much in the past. Do you think it would have caused permanent damage? That's the scope, only slightly smaller. Dandy scope. I see you have the clock drive, slow-motions and setting circles. I doubt you did permanent damage, but when it was too tight when your local astronomy club guru did the star test? Sorry, I've been away on business for the last week. Yes, he was the one that suggested that the mirror might be too tightly clamped into it's cell. I checked it after I got home that nite, and indeed, I had screwed it in pretty tight, partly out of ignorance, but also partly out of caution, since the last time I had 'used' it before that was to take it for a car ride to N. NJ for realuminizing. Didn't want it shaking around, especially on a quick stop, which is sometime necessary in NJ.